Bladder leakage is not your fault… and you shouldn’t have to suffer any more. If you know you need treatment please Talk to one of our Doctors or Nurses. No Drugs, no Surgery, no invasive Probes, no more rides on the Referral round-a-bout, AND….. no more humiliation! Recuperation can be as simple as sitting in a chair, fully clothed. The pelvic floor controls your urinary, bowel & sexual functions yet these muscles are your most neglected. This breakthrough technology builds strength and endurance back into the pelvic floor muscles. Think of it like this: the pelvic floor is the conductor of our urinary orchestra. Our urinary function is complex but needs to be in harmony. The therapy works by creating a pulsed magnetic field which easily penetrates bone and soft tissues, simultaneously reaching all nerves and muscles controlling urinary function. This therapy has been available in Australia since 1999. We believe this treatment should be your first line, doctor recommended therapy. Treatment sessions last for 22 minutes and will exercise the pelvic floor muscles 20 times more effectively that you could manage yourself, even if you were proficient at Kegal Exercises. The Wave Brilliance Pelvic Floor Therapy System is a non-surgical therapy for the treatment of stress, urge and mixed urinary incontinence & in both women & men. For patients whose difficulties stem from a weakening of their pelvic floor muscles, Wave Brilliance can offer unique therapeutic benefits. Unlike other therapy options, ExMI exercises all of the muscles in the pelvic floor to rebuild strength and endurance and restore bladder & bowel control. ExMI accomplishes this while the patient sits fully clothed in a comfortable chair. The technology that makes this treatment possible is Extracorporeal Magnetic Innervation, or ExMI™ for short. The process is similar to Kegel exercises for the pelvic floor. 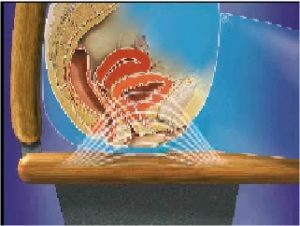 While conventional Kegel exercises (or “Kegels”) enhanced by biofeedback techniques can help to restore continence, we often perform the exercises incorrectly, incompletely, or inconsistently. With ExMI, the system performs the exercises for the patient in a more complete and effective manner than the patient could do on their own. No active participation by the patient is required. It’s a lot simpler than you might think. ExMI technology produces highly focused pulsed magnetic fields. To receive treatment, patients simply sit in a specially designed chair that allows the therapeutic fields to be easily aimed at the muscles of the pelvic floor that control continence. The pelvic floor muscles contract and relax with each magnetic pulse, creating a physical exercise like any other muscular workout, except the brain is not directing the contraction – ExMI is. One way to think of ExMI is as an automatic Kegel exercise machine or pelvic floor gym. Before receiving ExMI treatment, a patient needs to be fully assessed, to make sure their bladder control problem is the type that can be helped by ExMI therapy. Once it has been determined that the cause of the condition is weakened pelvic floor muscles, ExMI may be prescribed. Doctors/nurses have the liberty to create highly specific prescriptions for each patient to ensure the highest probability of improvement. After the initial diagnostic consultation, treatments can be performed in an office environment. During treatment, a patient sits fully clothed in a specially designed chair that has the ExMI technology embedded in the seat. The treatments, which are typically performed twice a week, are painless and take approximately 20 minutes. A complete course of treatment may take eight weeks or more, depending on the condition of the pelvic floor muscles when therapy is started. Scientific studies have shown that rebuilding the pelvic floor muscles with ExMI is effective in helping patients regain continence. In addition, patients treated with ExMI have reported significant improvements in their quality of life. Over a course of ExMI treatments, the treating physician or staff can provide advice on how proper diet-voiding habits and exercise can help ensure long-term freedom from the worries of urinary or faecal leakage. ExMI Therapy is not appropriate for all patients. The treating practitioner will determine if ExMI is right for you. The Practice and / or authorized representatives provides your treating doctor with Practice Management Services in accordance with their instructions. Your treating doctor is responsible to you for all conduct.